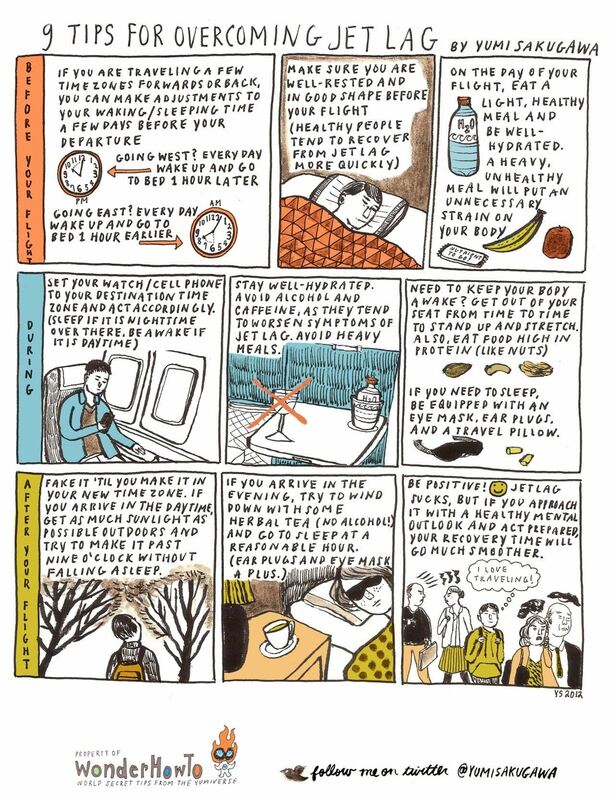 Jet lag is inevitable when you're traveling long distances by plane, and it can leave you feeling completely wrecked for several days to a week after you arrive at your destination. For people who simply cannot afford the few days to completely recover from the physical and mental exhaustion of jet lag, there are a number of simple preparatory steps you can do before, during, and after your long flight to minimize jet lag fatigue. Trick question! If you're going exactly halfway around the world (12 time zones) do you go to sleep earlier or later the days prior to? that is a good question. anyone? when i flew to paris (9 hours ahead of pacific coast time) and my plane landed in the morning, all i could do was sleep as much as possible on the flight to pretend that it was night time and stay on my feet all day long once i landed. and it worked like a charm! To adjust to time zones 8+ hours different, I take just a 2 hours nap the night before instead of a full night's sleep. Upon arrival I immediately adjust to the new time zone and go to sleep at the new appropriate time. This gives you a bit of jet lag the first day, but you adjust very quickly to the new time zone! At least it works every time for me! I don't understand something in the first "During" panel: "Sleep if it is night-time over there, be awake if it is night time." Ignoring the comma splice, is the point that you should sleep if the people at your destination spell night-time with a hyphen, and be awake if they spell it open?" Yes, just a typo. It's been fixed. Thanks for pointing it out. Pretty good tips. (I think "Be awake if it is night time" was just a typo.) I studied in Rome for three years, and from my experience I would say: don't be afraid to take a nap while you're adjusting, rather than forcing yourself to stay awake all day. I could never sleep more than an hour or so in the daytime, and then I would be refreshed and still able to sleep at night. It takes a few days, but your body adjusts naturally to the new time zone. sorry everyone, that was a typo. (probably from jetlag... since i am abroad when i made this.) thank you justin for fixing!! A dose of melatonin before bed on the first few nights at the destination seems to work very well for me. i heard about that but never tried it myself. good to know!! Yeah, give it a try; some people I know say it doesn't help them, but some people, like me, seem to respond to it well. Another thing I forgot to mention, and have never actually tried myself, is acupuncture. I have a friend (an acupuncturist) who swears he can cure jet lag instantly with a few well-placed needles. I can't vouch for that, but I've had dental work done with only acupuncture for pain prevention, so I won't say it wouldn't work! Its a hormone the body naturally makes so this is a better option than OTC sleeping pills. Great suggestion! my worst jet lag is from 23+ hours of flight between Chicago and Singapore/Kuala Lumpur. It's a 12-13 hour flight to one of the east gateways (tokyo/seoul/taipei) or the europe gateways (paris/amsterdam) or the middle east gateway (istanbul/dubai/dohar) and then followed by another 9-10 hours. I can sleep on both flights, but I have to wake up to change flights/go through security/airport stuff. when I get to my destination I'm a zombie for 2 days. Sleep is not the only circadian rhythm you have to reset. After the flight: eat meals in the local time; try to eat at the same times of day for the first few days. Don't just "play it by ear" and let your blood sugar scrape the basement. I plan my days by planning meals first, and then planning other activities around them, because I'm diabetic and if I don't I'm libel to murder somebody. Even if you're not diabetic, don't fool with your blood sugar; get it back into sync along with your sleep cycle, and you'll be laughing. Great tip. Thank you! I agree, meal times definitely makes a big difference.